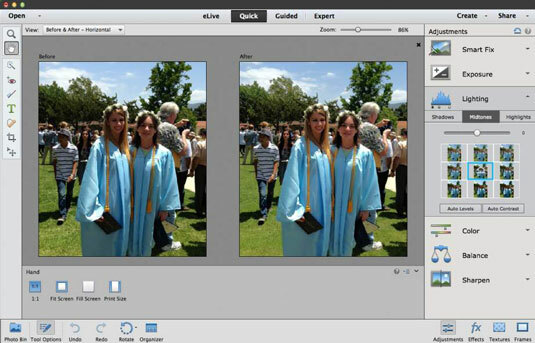 If you get the results you want with the auto-fixes while working in Quick mode, you may already have all the tools you need to repair and enhance your images. This means that you may not have to visit Expert mode at all. In the Organizer, select one or more photos. Click the Photo Editor button at the bottom of the workspace and then click the Quick button at the top of the workspace. You can also specify the Zoom percentage by using the Zoom slider in the Tool Options or in the upper right of the workspace. To rotate the image in 90-degree increments, click the Rotate Left or Rotate Right (accessed via the arrow next to Rotate Left) button in the left side of the workspace. Remove the red from your subjects’ eyes. Automatically fix red-eye by selecting the Red Eye Removal tool from the Tools panel and clicking the Auto Correct button in the Tool Options. If that doesn’t work, try clicking the red-eye in your image with the Red Eye Removal tool itself. Apply any necessary auto-fixes, such as Auto Smart Fix, Auto Levels, Auto Contrast, and Auto Color Correction. All these commands are on the Enhance menu or under Smart Fix, Lighting, and Color in the right Adjustments pane of the workspace. Click a down-pointing arrow to access the various commands. If the commands aren’t visible, click the Adjustments button in the lower-right corner of the workspace. Usually one of the fixes is enough. Don’t stack them on top of each other. If one doesn’t work, click the Reset button in the upper right of the image preview and try another. If you’re not happy, go to Step 8. If you are happy, skip to Step 9. If the auto-fixes don’t quite cut it, gain more control by using the sliders, or clicking the thumbnails, that are available for Smart Fix, Exposure, Lighting, Color, and Balance. For all adjustments, you can now hover your cursor over any of the thumbnails in the pane to get a dynamic preview of that particular adjustment. The slider will automatically move accordingly. Vibrance: Adjusts the saturation of an image by increasing the saturation of less saturated colors more than those that are already saturated. Tries to minimize clipping (loss of color) as it increases saturation and preserves skin tones. Move the slider right to increase saturation. The values are in increments of F-stops and range from –1 to 1. Whiten Teeth: This digital fix whitens teeth at a fraction of the cost of the real analog procedure. Choose an appropriate brush size from the Tool Options before whitening. Using a brush diameter that’s larger than the area of the teeth also whitens or brightens whatever else it touches — lips, chin, and so on. Click the Brush Settings option to specify Hardness, Spacing, Roundness, and Angle of the brush tip. Click the teeth. Note that this tool makes a selection and whitens simultaneously. After your initial click, your selection option converts from New Selection to Add to Selection in the Tool Options. If you pick up too much in your dental selection, click the Subtract from Selection option and click the area you want to eliminate. When you’re happy with the results of your whitening session, choose Select→Deselect or press Ctrl+D (Command+D on the Mac). Spot Healing Brush/Healing Brush: These tools are great for fixing flaws, both big (Healing Brush) and small (Spot Healing Brush). You can find these same fixes (and many more) in Expert mode, under the Smart Brush and Detail Smart Brush tools. You can add any desired text by clicking your image with the Text tool. You can now use the Move tool in Quick mode to fine-tune the positioning of your text. This fix should always be the last adjustment you make on your image. Sharpening increases contrast, so you want to fix the flaws first so that you don’t exacerbate them by making them more noticeable. In Quick mode, click the Effects icon in the lower-right corner of the workspace, and you’ll find various effects, such as Toy Camera and Cross Process, to apply to your image. Click the Frames icon and you can apply borders, such as Scalloped and Scrapbook, to the perimeter of your photo. Finally, click the Texture icon to access textures, such as Blue Wash and Old Canvas. Click the Adjustments icon to return to your default panel settings. To apply an Effect, Texture, or Frame, simply click the thumbnail in the pane.